Image Size: 21"w x 34"h.
Just outside New York City runs the Passaic River and one of the most impressive sets of waterfalls in the east. 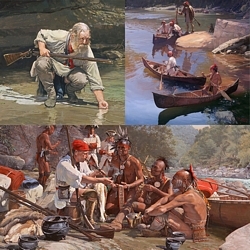 The Lenni Lenape Indians knew the falls well as a prime camping and fishing site. They called it “Totowa,” to sink or be forced down beneath the waters by weight, a tribute to this awesome mass of water. The falls were also a natural bottleneck for prodigious amounts of sturgeon during their annual spawn. Long before the canvas sails of the Europeans appeared on the ocean’s horizon, present-day Paterson, New Jersey, was an important and thriving Indian community. John Buxton’s award-winning "Great Falls of the Passaic" is a stirring reminder of the astonishing wilderness sites and bygone way of life that have long since been swallowed up by urban growth. This Fine Art Limited Edition Canvas is a work of that art educates, inspires while bestowing a natural beauty and grace to any room in which it hangs.